I have fitted LC-1 wideband, Yoshi R-55 and inlet airbox mods with two 2" inlets and K & N, otherwise engine is stock. There's a thread on here somewhere which shows what to do. basically where the existing 7/8? inlets were I have holesawed out and fitted two 2" Silicone hose 90 degree elbows. wayne you did plug you pair valve, yes? ok weird thing erased the esu,erased all my map from before,reset my wide band to match the data logger,reflased the ecu witha stock map,pair off and checked wide band,now the bike idles around 12.9 .the weather has droped about 10 deg. but I would not think that has a lot to do with it in the garage. WOW, is anybody on here anymore? ok did some rides and toke my logging and auto tuned my stock map,after auto tuning it,I made it my test map, when I go back in to my test map and open my logs in my test map it still looks like I have to make changes once more.am I missing a step here? Auto tuning will apply to whatever map is currently open. It is very important to only open logged data in teh map for which it was logged. Open teh latest map first, then open the logged data. If the logged data was not made with the map that is currently open, the log is invalid as far as auto tuning suggestions. I have had to tell a couple people this. Ok cool, so you are following the process i listed below? Yes. You can read the ecu with Ecu Editor or Woolich Racing Tuned Software under the tools menu. I recently purchased the log box and I'm having trouble viewing logs. I couldn't view boost in my logs. After further investigation with the issue I realized the problem may be because I was viewing WRL logs in ECU editor and I need to convert WRL to CSV. Any suggestions to view WRL in ECU editor so I can see boost? Hi, can you please send us a sample .wrl log file so we can test this issue. I am assuming you are using the latest version of ecueditor? I have those files shared in this post. I keep getting an Error when I try to read the ECU or write to the ECU. I can use the engine data and thats it. I haven't messed with the Log box in about a year. 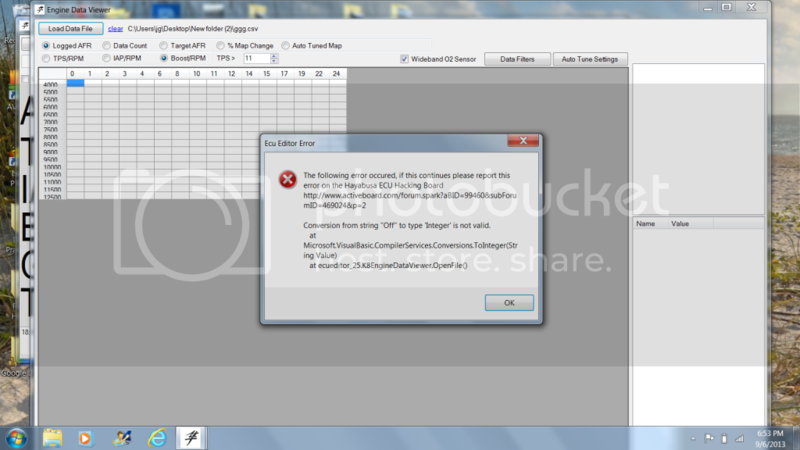 Hi, if you are getting this error message it means you have created a new account in WRT. The easiest way to resolve it is to go back to using your original WRT account, please contact us if you need your original WRT account reset or password changed etc. I purchased on of the first beta log boxes back in 2012, The USB connector broke off on the inside of the box. I have a LC1 wide band installed and want to make sure the new Logbox V2 will work with my LC1. Also can I get a discount? This will be the 4th flashing box I've purchased. On for my Bking, and two for my busa's (08 and 2011).